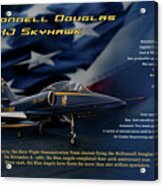 Blue Angels Ta-4j Skyhawk by Richard Hamilton - 10.000" x 6.625"
Blue Angels Ta-4j Skyhawk framed print by Richard Hamilton. Bring your print to life with hundreds of different frame and mat combinations. Our framed prints are assembled, packaged, and shipped by our expert framing staff and delivered "ready to hang" with pre-attached hanging wire, mounting hooks, and nails. 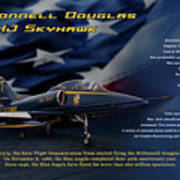 There are no comments for Blue Angels Ta-4j Skyhawk. Click here to post the first comment. Honoring the patriotic service of the men and women who serve our country and all our allies around the world. I take great pride in my military fine art collection. Whether participating in battle or providing support, these military aircraft and helicopters served an important role in our military history. Immerse yourself in wartime aviation with my exciting array of fighters and bombers.